Dallying In The Dirt, Issue #263 - A real Dill of a pickle from Mother Nature. Mother nature has me in a real pickle. Some days she provides me with delightful surprises and then. One of those pickles is a dill pickle. 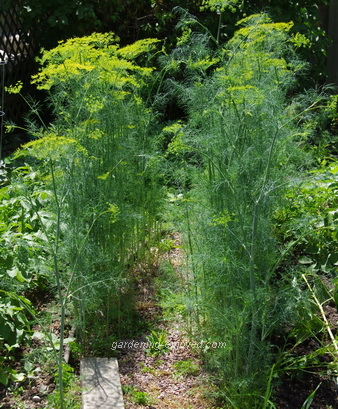 Dill has been haphazardly seeding itself in various places in my garden for several years. This year it has outdone itself. It’s growing, nay thriving, along the edges of the gravel paths that wind their way through the vegetable garden. A walk around the garden leads you through this tunnel of dill that provides a powerful olfactory reminder that I could never intentionally get Dill to grow in the pink gravel but left to her own devices, Mother Nature does a superb job of it. It hasn’t rained here in several weeks. That part of the garden has a drip irrigation system throughout it and I guess the Dill’s roots run past the plastic edging and find some of that precious water. I like Dill as a herb in a variety of things so I just take my scissors and walk around the path to find a ready supply for the evening’s meal. Yesterday I purchased and installed some more drip irrigation. It’s not very expensive and the installation of about 75 m (240') took about an hour. It would be faster to do if the beds were not already filled with Asparagus, Daylilies and Iris. Weaving the 0.6 cm (.25") drip tubing in between all of that growth does slow the process. The Asparagus and those perennials certainly appreciated their long drink last night and I may give them some more tonight as the soil is still not overly moist. Here is another pleasant surprise in the vegetable garden. This huge Zucchini plant has already provided us with two additions to the dinner menu. It self seeded from a Zucchini that was growing near that spot last year. I would never have direct sown Zucchini seed and certainly not as early as this one must have germinated. A relatively mild winter and some very warm early spring weather combined to give us this treat. 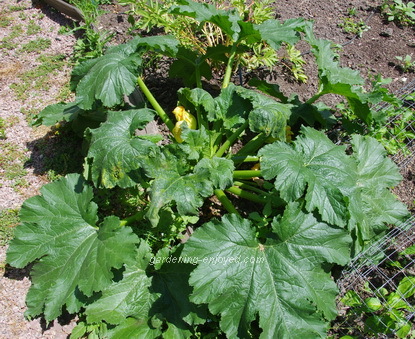 Should I take Mother Nature’s example and plant some Zucchini seed in the late fall this year? I might try but somehow I think I know what the result will be. The plants that I started indoors are at least another two weeks away from producing edible fruit. I was very interested to see what the fruit would be like as many members of the squash family will happily cross pollinate and provide us with some rather strange progeny. This one seemed to be a healthy and tasty Zucchini that closely resembled its parent. Last night was the first meal with fresh Peas and their sweet taste was a real treat. After a few weeks of limited choice for the dinner plate, suddenly we have more choices than we can enjoy at one meal. For the next few months we will be able to feast upon several tasty delights each night, the great reward for the hours of planning and planting. Suddenly Ms. Nature gives me another surprise. In the last issue of “Dallying” I told you all about the Wisteria tree I was happily making. I did notice that the bottom of the 4"x4" was looking a bit weak and had decided to support it with some sections of rebar. Earlier this week, I was having breakfast and admiring that Wisteria while noting that the wind was noticeable that morning. 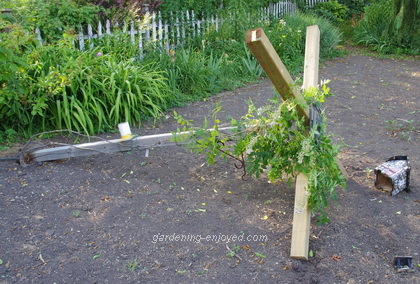 As I stood there watching, the 4"x4" snapped at the base and the fledgling Wisteria tree came crashing to the ground. What it is about the interaction of air, soil and moisture that rots wood at the soil line but leaves it quite solid above and below. Do I try to dig out the bottom of the post and insert a new one? Any digging cannot be confined to the actual post and the area around it will be filled with the roots of the Wisteria which I really don’t want to cut and disturb. I have driven in one of those long metal 4"x4" holders, having tested the area with a slender piece of rebar to make sure I wasn’t going to hit any significant Wisteria roots at that location, and now will stand up the new post and hope that the structure will be sturdy enough. The Wisteria vine has been carefully untangled from the old structure and is laying on the ground waiting to be wound around its new home. There always seems to be another unscheduled chore to keep my life interesting. This one took a few hours and a few dollars but the result will, hopefully, be an improvement and the Wisteria will not be the worse for wear. Last week I tried to give you a link to story about a new Downy Mildew that was attacking Basil. Apparently the link did not appear. Here it is. Linda Asks? I have noticed lately that the leaves on two of my rose bushes look brown, dry, and crumbly. What could be causing this. Ken Answers! Any number of things. Some of mine are being chewed by a lovely green worm and the bits that he leaves are brown and crumbly. The lack of rain is contributing to this drying out. I keep searching for the worm and picking them when I find them. They never seem to be where you think they should be. Don Asks? What would you use to rid the Ficus of Scale?? Ken Answers! Depends on the severity of the infection. Hand cleaning with alcohol and Qtips or compost the while thing. Tough choice. Jean Asks? I moved my asparagus to my vegetable garden last fall doing all the prep required. When the Spears emerged they all were curled right over rather than straight. I have left them rather than harvest and they have uncurled. I have not been able to find the cause. Any ideas? Ken Answers! Emerging spears are somewhat delicate. If the soil is too hard they will curl to push up with the curl rather than the point. Any slight damage from the harvesting knife to footprints will also cause curling. Left alone, most spears will uncurl and me perfectly edible.